Antiguans like to boast that they have 365 beaches -- one for each day of the year. And while no one counts to ensure the accuracy of this catchy marketing claim, the squiggly shaped island indeed is full of beachy gems, each with its own unique appeal. Part of the West Indies, Antigua was first occupied by the peaceful Arawak Indians around 200 B.C. They stayed until the arrival of the Caribs, an Amazonian tribe, whose name was derived from the Spanish word "caribal," meaning "cannibal." Then, the island was known as Wadadli until 1493 when Columbus, who never made landfall, sailed by and named the island in honor of Maria de la Antigua, a saint he worshipped in Seville. The English arrived in 1632, establishing sugar plantations and bringing African slaves; slavery was fully abolished in 1838. Great Britain held the island until 1981, when Antigua (pronounced "An-tee-gah") achieved independence. The island was an important colonial base of the Royal Navy, with English Harbour serving as its headquarters. The remains of the navy's presence represent some of the most fascinating attractions -- a walk around historic Nelson's Dockyard and the grounds of Shirley Heights reveals remnants of a working Georgian-era harbor, old forts and officer's quarters, as well as a multitude of crumbling sugar mills from the days when sugar plantations ruled the island. In more recent years, English Harbour has become the capital of international yachting and sailing, and those activities are responsible for a surge in population during the winter months. The season opens in December with the Antigua Yacht Show and ends in May with Antigua Sailing Week, one of the largest annual regattas in the Caribbean. Since gaining independence, Antigua has all but abandoned its agricultural heritage in favor of a tourist economy. The island can hold its own in the duty-free shopping category, but the real highlights lie well beyond the capital and port town of St. John's. And if all those beaches aren't enough, Antigua's sister island, Barbuda, is accessible by ferry for day-trippers. The ferry drops you in the middle of 14 miles of unspoiled pink shell beaches -- including one that used to be a favorite of Princess Diana; it's now named in her honor. 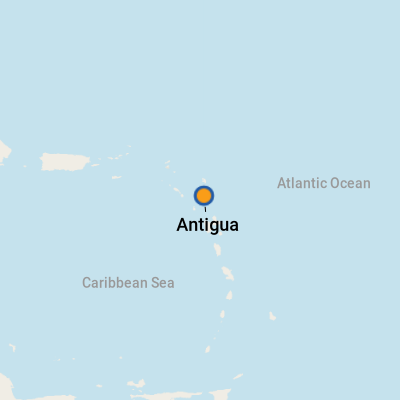 Antigua owns an average high temperature of a pleasant 81 degrees, but it's a slightly less hospitable climate in the summer when the trade winds die down. Antiguans celebrate these slower summer months with the annual Carnival at the end of July and beginning of August. The island is susceptible to hurricanes and tropical storms, with a direct hurricane hitting about every seven years on average. The highest risk is in early September -- so there's little need to worry during peak cruising season. Bring your umbrella, though, because more than half of the days in November through February experience rainfall. Your ship might be docked at any of three spots: Heritage Quay, neighboring Redcliffe Quay or the more distant (10 to 15 minutes by taxi, depending on traffic) St. John's Deep Water Harbour. Heritage and Redcliffe Quays are in the heart of St. John's, the capital city. You'll find shopping, restaurants, bank machines and transportation when you step off the pier. Deep Water Harbour is the town's industrial port, with no services. However, plans are in place to develop the surrounding area to create an additional full-service cruise port. At Heritage and Redcliffe Quays, you'll find indoor/outdoor malls for duty-free shopping, as well as several stalls of crafts and souvenirs. Restaurants and bars (many with free Wi-Fi for customers) are mixed in among the shops -- and you'll also find King's Casino just off the main pedestrian zone of Heritage Quay. The area around Redcliffe Quay is more tasteful, scenic and pleasant for browsing, but it's still touristy. Within easy walking distance of the dock, you'll see several downtown landmarks, including the Museum of Antigua and Barbuda and the Cathedral of St. John the Divine, built in 1845. Deep Water Harbour offers no services. As a former British colony, Antigua maintains the practice of driving on the left. Be particularly careful when crossing streets. There can be traffic backups in downtown St. John's, particularly if it rains or during evening rush hour. If you're docked at Deep Water Harbour, allow extra time to get back to your ship. On Foot: If you're docked at one of the town quays, you could easily spend a couple hours on foot, exploring the town, shopping and having a bite to eat. We don't recommend walking into town from Deep Water Harbour, though. There's no sidewalk along the main road, and the neighborhood looks a bit dicey. By Taxi: Walk straight up from Heritage Quay, and you'll find two taxi kiosks, where drivers congregate (away from their cars because this is a pedestrian area). Bargain a bit or keep walking to the first cross street, Thames, where drivers hang out with their taxis. Most Antiguan taxis are vans or mini-vans, and you'll get a much better price if you put together a group. Rates are supposedly set by the government, but in our experience, every taxi fare was negotiated. The government website posts official rates. If your ship is at Deep Water Harbour, count on the fare into town running around $10 to $12. That can average as little as a dollar or two per person if a driver is trying to fill up a van. By Bus: Feeling adventurous? Consider taking a bus. The main station is located across from the Public Market Complex, between Valley Road and the water, and to the south (or right, if you've just gotten off a ship) of Heritage and Redcliffe Quays. The small No. 17 bus runs to Nelson's Dockyard approximately every half hour. (We say "approximately," because people flag it down along the way or call out "Stop here!" when they want to get off, and you never know how many times it's going to stop.) The bus goes to the dockyard's front gate. Allow at least 45 minutes each way for the ride. By Rental Car: Hertz (268-462-4114) and Dollar (268-462-0362) have cars available in downtown St. John's, and you can also find local options. You'll have to buy a temporary driver's permit (U.S. $20 or E.C. $50). Rental car companies can expedite it, but you'll need your driver's license and passport with a valid immigration stamp. Also, gas prices are steep -- about double what you pay in the U.S.
Antigua uses the Eastern Caribbean dollar (E.C. ), although most vendors in town will readily accept U.S. dollars. Visit www.xe.com or www.oanda.com for currency-conversion rates. A small Scotia Bank ATM kiosk is located right on the water, between Heritage and Redcliffe quays, and you'll also find an ATM at King's Casino, just off of the pedestrian area at Heritage Quay. Both distribute U.S. dollars only, and both levy a fee. A bit farther away (about a five-minute walk), you'll find Scotia Bank, RBC Bank and CBC First Caribbean Bank -- all with ATMs -- at the intersection of High and Market streets. English is the main language on Antigua, although in some of the smaller villages around the island you'll find Spanish as well. Antigua's international yachting crowd supports a broad range of restaurants and cuisines -- more than you might otherwise expect to find. So, if you're craving Italian, French or even sushi, you'll find options. Plenty of hangouts are located around Heritage and Redcliffe Quays and at more far-flung eateries at beach resorts around the island. If you go for local cuisine, beware -- it's spicy, and there's often a bottle of hot sauce on the table to kick it up even more. Look for dishes like fungee (pronounced foon-jee-- and sometimes spelled fungi or fungie), a cornmeal dish similar to polenta; ducana, a side dish made from sweet potatoes, grated coconut, sugar and spices and steamed in a banana leaf; chop-up, a mixture of eggplant, spinach and okra, all chopped and mashed together; pepperpot, a stew of meat and vegetables, flavored with hot peppers and cinnamon; and dishes made with dried, salted fish, known as "salt fish." Wash it down with a Wadadli beer, spicy ginger beer or fruit juice. Visit the Sarah Fuller Pottery Shop on Redcliffe Quay to take home a handmade pottery lighting sconces. You'll see them all over the island in homes, hotels and downtown areas. Lights shine through cut-out designs of lizards, fish, seahorses, flowers and other shapes. She also makes fun mobiles with ceramic bells, fish and driftwood. Just across from Sarah Fuller's, pop into Gift Stop, where you can sample and buy Antiguan rum cakes made with Cavalier Rum. We think they're even tastier than the more famous Tortuga version. Order a Wadadli beer, a light brew made on the island, or a rum punch made with Antigua Cavalier Rum, also made locally. Too soon for happy hour? Sip a spicy ginger beer. Or try a lime squash, an island specialty made with sparkling water, fresh lime juice and sugar.